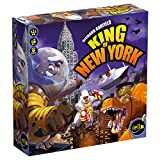 King of New York is a standalone game from designer Richard Garfield that keeps the core ideas of King of Tokyo while introducing new ways to play. As in KoT, your goal is to be the first monster to collect 20 victory points (VPs) or to be the last monster standing. On your turn, you roll six dice up to three times, then carry out the actions on those dice. Claws cause damage to other monsters, hearts heal damage to yourself, and energy is stored up so that you can purchase power cards that provide unique effects not available to anyone else. 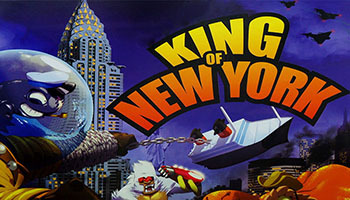 The game board for King of New York is larger than in KoT with each monster occupying a district in the city and everyone trying to shine in Manhattan. When you attack, you can displace a monster in another district, whether to escape military forces or to find new smashing opportunities. Yes, smashing because you can now destroy buildings and get bonuses for doing so, but the more destruction you cause, the more intense the military response. These are rules for 5-6 experienced Monsters. 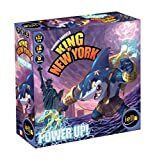 In a 5- or 6-player game, there can be two Monsters in Manhattan. The rules are the same for these two Monsters. Having one additional place for the Monsters is quite significant when you have so many Monsters stomping about. When a card or an effect targets the Monster in Manhattan, it affects all Monsters in Manhattan. If Manhattan has fewer than two Monsters during your move step, you must move into Manhattan.